Best Friend Fence's dog containment fence is the top choice for pet owners who are interested in keeping their dog in a safe secure area. It's an effective dog containment fence that doesn't use harmful features like electricity or shock collars. It's a humane way to make sure that your dog is safe from escaping from your yard. Our dog containment fence is very affordable and it's more dependable then the traditional wood or chain link fencing. Simple to install and easy to maintain, the protective integrity of our dog containment fence will not diminish over time. The dog containment fence from Best Friend Fence is designed endure nature's elements and will not rapidly deteriorate. Constructed of black polypropylene UV resistant plastic, our dog containment fence is high strength, durable and will withstand even the harshest of temperatures. Designed for many years with very minimal maintenance Best Friend Fence has the long term solution for your dog containment fence needs. Click here to view all of our available dog containment fence products! Unlike metal or chain link fencing, the dog containment fence from Best Friend Fence won't rust, and is environmentally friendly and recyclable. Its mesh grid-like netting pattern prevents your dog from sticking their nose through the holes and getting injured. Our dog containment fence is the safe way to protect your dog. A dog containment fence from Best Friend Fence won't take away from the aesthetic value of your home, in fact, it will add to it. Many dog containment fences act as barriers between your home, and the outside world. They visually close off your backyard from the rest of the neighborhood. Best Friend Fence's dog containment fence is virtually invisible from nearly 20 feet away. 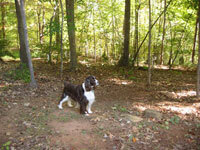 They offer protection for your dog, without being obstructive to the natural beauty of the rest of your yard. It also works to protect your yard and landscape from critters and local deer. Best Friend Fence offers you comfort in the knowledge that not only is your dog safe, but the yard that you have spent weekends to perfect still looks great. Another great benefit to a dog containment fence from Best Friend Fence is that it is easily to install. Unlike other dog containment fencing, it requires minimal digging so you can protect your dog from escaping without having to destroy your yard. Each dog containment kit comes with innovative durable mesh, steel posts and fastening components that will insure that the installation will be easy and the fence will be strong and dependable. You won't need to a hire a professional to install your dog containment fence but if you would like the option, we do have our very own installation company, Deer Fencers, will be more than happy to discuss your customized options. The kits can be purchased to adhere to nearly any size area you want to designate and can be altered to fit any specific situation you might have. We have different length rolls to accommodate larger and smaller areas and different heights for different size dogs. With all of the different combinations of fence lengths and heights, we are sure that we have a kit that will fit your individual needs. The dog containment fence from Best Friend Fence can be reinforced as well. If your dog is a little more rambunctious than other dogs, we have a kit that can help you strengthen it. The kits come with more fastening parts and more steel posts that can make your fence stronger. We also have nylon tension cable available to prevent the fence from sagging low enough for your dog to jump over it. The way the fence is constructed can also prevent dogs from digging underneath it. Even the most persistent of dogs have met their match against the Best Friend Fence's dog containment fence. We have dog containment fence kits that are designed to be "Chew-Proof" so that your dog won't be able destroy it by constantly gnawing on it. Also, the way that the fence is designed, it's nearly impossible for your dog to get its nose through one of the spaces in the fence. This prevents your dog from getting its teeth on anything that would lead to a hole in the fencing. This is great for the durability of the fence, and for the health of your dog. The "Chew-Proof" fence will prevent your dog from accidently ingesting any piece of the fence that they might tear off. This is one of the many reasons why Best Friend Fence's dog containment fence is more pet friendly then other alternatives. Benner's Best Friend dog containment fence is easy to handle and install. It can even be installed behind an existing chain link, split rail, or wrought iron fence to add height or increase the security level of your enclosure. Simply attach the Best Friend Fence dog containment fence to your existing fence and posts and snugly fasten it with zip ties. Make sure to flare the bottom six inches of the fence to the ground and then in toward the center of the enclosure in a sort of "L" shape, staking the dog containment fence to the ground. Cost-effective and simple to install, our dog containment fence will help you to create the enclosure possible for your furry friend. GO GREEN with Benner's Garden's Dog Containment Fence! Benner's Garden's "virtually invisible" dog containment fences are the environmentally friendly way to protect your landscape, property, and gardens from the insatiable appetites of deer while simultaneously allowing your dog to run free in a safe environment. Long-lasting and UV-Resistant, our dog containment systems are comprised of UV-treated black polypropylene that is stretched into a grid-like pattern (1.75"x1.75"). This unique construction creates and strong, durable barrier that is lightweight and easy to manage. The thin, "virtually invisible" profile allows the dog containment fence to easily blend right into any landscape design. Made out of recycled polypropylene plastic, our fence is completely recyclable and will not cause harm to your dog or to local wildlife. When you install a dog fence containment system from Best Friend Fence, your dog can safely play and your landscape and gardens will be protected from hungry deer! At Best Friend Fence we give you the peace of mind of knowing that your dog is safe in our dog containment fence. Our dog containment fence is the most highly trusted and humane solution for keeping your dog in a safe environment. You will love your Best Friend Fence's dog containment fence, and your dog will love you for keeping them safe and injury free.